Tatiana Parker - DWDE LTD.
﻿Tatiana Parker started dancing at the age of five and has since then been able to travel between Toronto and Los Angeles training with many of the industry’s top leaders. Her passion for the art was one she could not ignore. A career as a dancer and choreographer was inevitable. 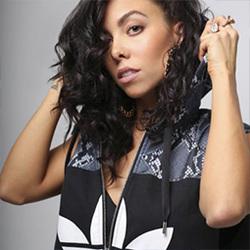 Tatiana’ s credits include; So You Think You Can Dance Canada – season 2 – top 20, commercials – Much Music, Virgin Mobile, Disney’ s High School Musical, iSkin, music videos – Blake Mcgrath, Skye Sweetnam, Eva Avila, Addictiv, Thunderheist and more. She has worked with artists on numerous live and touring performances, some of which have enabled her to travel throughout North America, Europe, Middle East, and Africa. Some of these artists include Hillary Duff, Massari, Akon, Kardinal Offishall, George Nozuka, Shawn Desmand, Kim Davis, Dru, and more. Tatiana is always looking for a new challenge. She is constantly improving, training and taking her dance skills to the next level. Her adoration for the performing arts translates into her enthusiasm when dancing, teaching or choreographing. Fully dedicated to her career, Tatiana is a strong believer that hard work pays off.